Here's the twill pattern I decided not to use. I was trying to shift the warp threads so the ikat design would be something like the letter 'N'. I shifted the twill direction to make it stand out more. 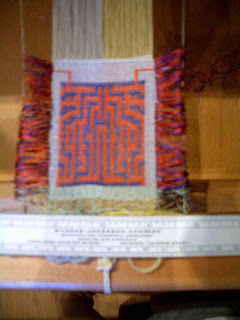 After weaving a bit I realized I wan't trilled about this twill pattern in ikat - a bit old fashion. 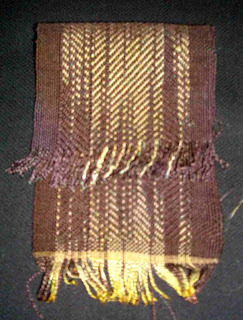 Ater I wove about six inches with the white ikat design I decided I didn't like the contrast between the white and the dark purple [which looks brown in the photo] so I decided to dye the white - golden yellow. I dyed both the woven part and the next six inches of the unwoven warp on the loom to see if there would be a big difference in the end product. 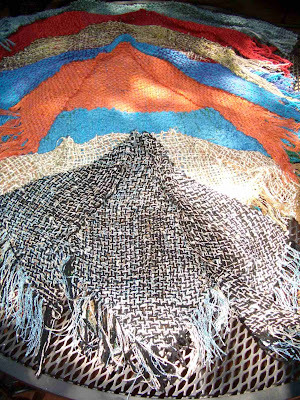 Once finished weaving, I painted the entire piece with a 2:1 water:white vinegar mix, wrapped it in plastic wrap and put it in my old crock pot. Remember that silk that I bought that was not color fast...I over dyed it with some ikat ties. It used to look like this. I shifted the design using the easy ikat method I learned at the ASCH conference in Visalia. I didn't like the initial pattern which was warped in a simple twill so I took it off. At the suggestion of a friend, I tightened the sett and used a finer weft. For the weft in the photo, I am using 60/2 silk in a pale yellow. I like how it looks. It would make a a nice border or lapel on a jacket. I finished up my third sample maze. This one is about fourteen inches long and two inches wide. I actually wove the beginning and end of the pathway through the maze to encourage the audience to try to connect the two paths. This photo only shows one end. I still have some warp left...enough for one more sample. I made some modifications to the pattern of sample three so this upcoming last sample will show the new final maze with the actual pathway throughout. This will be the shakedown to ensure I have no mistakes in the pattern and there is indeed a way through the maze. Then I should be ready to plan the larger piece. I finished my second maze sample...this one with the walls in blue, the path in yellow and the actual path to go through the maze in orange. The size is about 2 by 8 inches ignoring the fringe. I kept with the symmetrical look with the entry and exit point on the sides near the bottom of the photo. 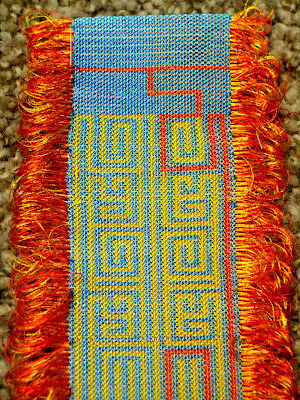 I used the blue as the locking thread so the fringe is 100% yellow and orange threads. The warp I have on the loom is half pale yellow and half pale sky blue. 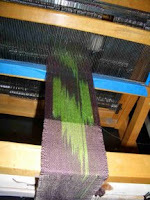 The yellow warp really makes the yellow weft pop in comparison to where the weft goes over the pale blue warp. Another thing to keep in mind when decided on final colors. The back side is most interesting too...lovely shades of green, purple and yellow-orange. I may consider doing a reversible piece. As promised, here is a sampling of my triangle scarves...there were more...but they were given away as gifts. I like the ones which are more lacy and light. Of course, this probably has something to do with the weather in Southern California....the fog came in this afternoon for a bit so some of these may still be wearable this season.